A move to end the exemption from compulsory military service for ultra-Orthodox men who are religious students reveals a fault-line among Israeli Jews. Ron emerges from the military enlistment office on a Jerusalem side street. He is an ultra-Orthodox Jewish teenager, who studies full-time in a yeshiva, or religious college. He's dressed in monochrome, and his face is as white as his shirt. "I asked for an exemption from military service as a yeshiva student, but the army rejected that, and no-one is telling me why." Ron is baffled. Something is shifting in Israel. There is a groundswell of popular resentment against boys like Ron who, unlike most other 18-year-old Jewish citizens, have been exempt from military service. The exemptions began in 1948. So many religious scholars had perished in the Holocaust that Israel needed to revive this fundamental part of Jewish culture. So Israel's first prime minister, David Ben Gurion, waived military service for 400 students. But by 2011, it was estimated 37,000 ultra-Orthodox men were studying at yeshiva schools - and therefore not taking part in military service. The escalating numbers have fuelled demands from other Israelis for them to share the military burden. This has been compounded by a decision by Israel's Supreme Court earlier this year which ruled exemptions on the basis of religious study were unconstitutional. So it seems that ultra-Orthodox teenagers like Ron will no longer get an automatic exemption. "They wanted to recruit me to the army next week," he tells Radio 4's Crossing Continents. "It's very stressful. I've just got an exemption for six months from the military psychiatrist. "I just never thought of the army as an option, and I've always concentrated on my studies in the yeshiva." The Haredim, as the ultra-Orthodox are often known in Israel, are Israel's fastest growing Jewish population and currently account for about 10% of the country's population. Large families with eight to 10 children are not uncommon - and by the 2030s, demographers believe one in five Israelis will be Haredi. This year alone, it is estimated up to 8,000 ultra-Orthodox boys will turn 18. And where Ron lives, everyone is worried. "Many people say the military is going to have to come into people's homes and force people to go into the army. Or maybe some kind of civil war is going to start, because they are not going to agree to it." This is not an argument about pacifism. The point is that many ultra-Orthodox Jews believe passionately their place is in the yeshiva and not a secular institution like the army. Inside a yeshiva in the west Jerusalem suburb of Bayit VeGan, row after row of men and boys rock and chant, deep in their devotion to the Jewish holy book, the Torah. Those who continue to study over years and decades acquire status in the community. "We are continuing the way of the Bible," says one student. "The Jewish way, to be Jewish - this isn't just about genes or a nation, it's a religion. And the reason we are in Israel is because of the Jewish religion. Our right to live in Israel is because we are Jews. "So what secular people should respect, and understand, is that what we are doing when we study in the yeshiva is giving us all a right to be here." In other words, learning and piety are as essential to Israel as knowing how to handle a gun - and Yitzhak Pindrus, the deputy mayor of Jerusalem, agrees. He represents the ultra-Orthadox community, about a third of the city's population. "I think the people who are keeping us as a nation are my brothers, my brother-in-laws, my uncles, my father - the people who are sitting and studying." Although Pindrus did military service himself, he is vehemently opposed to the compulsory draft being extended to ultra-Orthodox Jews. He says those who want to force the community into the army are trying to undermine their position in Israel. Currently the political wind is behind the deputy mayor - a member of United Torah Judaism, one of the ultra-Orthodox parties that make up Benjamin Netanyahu's government. But Israeli politics is a complicated coalition dance. In July the centrist Kadima Party walked out of the government after the prime minister refused to support a proposal to limit the number of yeshiva students exempted from military service to 1,500 a year. Now Netanyahu needs to keep his other political partners on side, and so far he has succeeded by making no firm policy in response to the Supreme Court decision. But this is not an issue that will go away. The Israelis campaigning for an end to what they see as special treatment for ultra-Orthodox Jews are making their presence felt. Thousands have attended demonstrations organised by Common Ground. Chairman Boaz Nol says every Israeli citizen should serve the country, whether in military or civil service. "We agree that those who are the future rabbis of the ultra-Orthodox community - perhaps 1,000 or 1,500 - can get an exemption. But the majority must serve." And he includes Israeli Arabs, and ultra-Orthodox women too. "Why not? Secular women serve. You need to decide if you are part of this game and part of what's going on in this country. The Supreme Court ruled the exemptions are not equal and not constitutional, and that there should be no discrimination between my blood and someone else's." Ofri Hod is not ultra-Orthodox. She has just turned 18 and is about to start her military service - and she is angry. "Me and my friends are going to the army and we're risking our lives. We could die. You see ultra-Orthodox people saying they're not joining the army because they are protecting Israel through prayer. It's very frustrating." This sense of unfairness is raising questions about what it means to be Israeli. "I don't see those ultra-Orthodox as Israeli as me, because they are doing nothing for the state," she says. The military has been part of the fabric of the nation for Israeli Jews since its creation in 1948. Its role is central, says retired Brigadier General Meir Elran of the Institute for National Security Studies. "There is a consensus, to a large extent, that Israel can only maintain its stability, prosperity and way of life because of the strength of the military, because we all share a vision of a national military apparatus," he says. "We have a sense we want everyone to be part of the military story." But he sees obstacles to integrating all ultra-Orthodox recruits in the army if the exemptions end - not least because of strict religious rules about the separation of men and women. For example, ultra-Orthodox men would not be able to listen across the communications system if a woman radio operator was speaking. Also, their education is not standard. "Regular Israelis learn maths, English - universal skills," the general says. "The guys who come from the ultra-Orthodox community don't. They have very specific skills, not necessarily in line with military needs." But in spite of the controversy, more young Haredim are joining up. 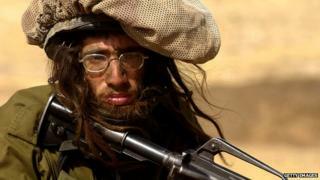 Some join the Nahal Haredi, an Israeli Defence Force battalion formed in 1999 that has close to a 1,000 troops. It is committed to ensuring ultra-Orthodox recruits do not have to compromise their religious lives in the army. At the military enlistment office in west Jerusalem, Daniel has just been inside for a medical. Aged 21, he has left the yeshiva and decided to join up. Daniel is hoping to be accepted by the Nahal Haredi battalion. "The army is important in Israel. My family are backing me, but a lot of people in my community think it's a very bad thing to do. It's not simple. There's pressure, and you don't want to lose your name because you join the army. "It wasn't an easy decision for me to make, and it will be harder for me to find a wife. But I hope I'll find someone who won't mind that I spent time in the army." Hear the full report on BBC Radio 4's Crossing Continents. You can listen via the Radio 4 website or download the Crossing Continents podcast.